Every bride wants to look her best on her wedding day. Once you’ve found the perfect wedding dress, the next step is accessorizing it with jewelry, belts, hair pins, and shoes. There are so many accessory options out there that sometimes, it can be hard to figure out where to start. Keep reading for some serious wedding inspiration. You’re definitely going to want to add some of these to your wedding Pinterest board. What kind of accessories are you planning on wearing on your big day? A gold headpiece is a great way to add visual interest to your ensemble. It also draws the eye upward, so there’s more focus on your beautiful face. 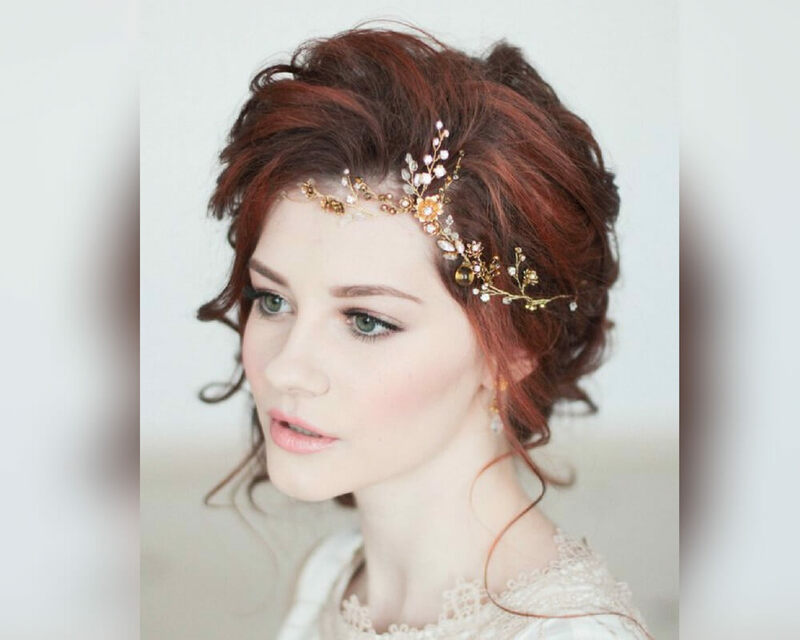 You can wear a headpiece, a headband, or a halo with your hair down or with an updo. This piece from EnzeBridal starts at $160. It comes in gold, silver, and rose gold. I love the delicate beading on this piece. Sometimes it’s difficult to choose between a jeweled sash and a fabric sash. This Avanti Sash from BHLDN lets you have the best of both worlds. Its soft pink color adds a touch of shimmer and its unique beading adds a whole lot of texture. 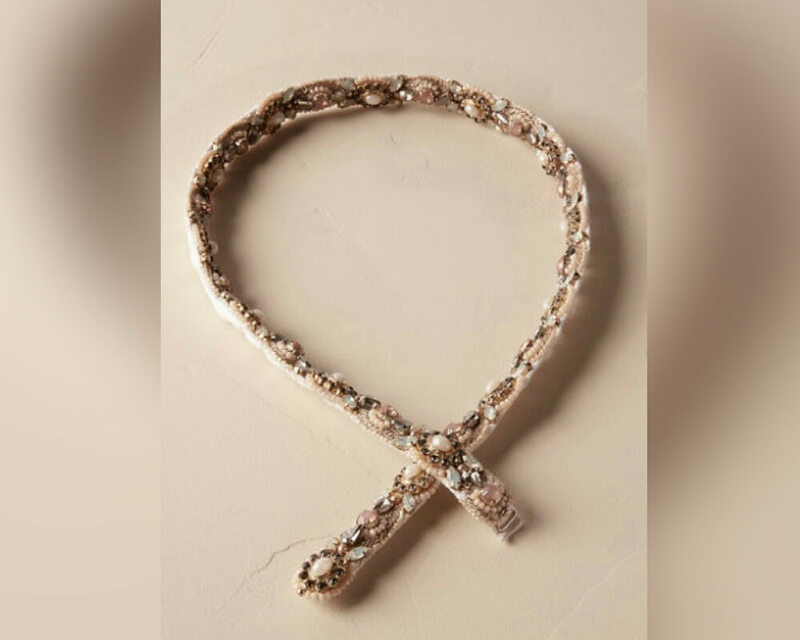 This sash would look great on a blush ballgown or on a simple silk A-line dress. It retails for $200. 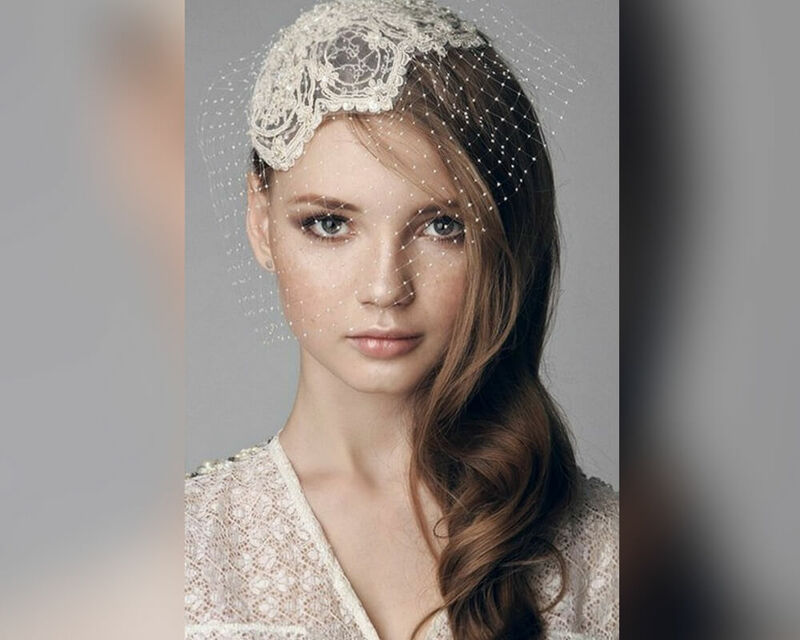 If traditional veils just aren’t your style, you could go for a more modern look with a birdcage veil or a mesh fascinator. This one from Etsy retails for $200. It’s fully handmade and it comes with a hidden clip and comb so you can fasten it to your hair. If your wedding has a vintage vibe, a veil like this could really tie your whole theme together. …And by wedding essentials, I mean snacks. Lots and lots of snacks. Even if you don’t want to wear a purse during your ceremony or your reception, it’s a good idea to have one close by just in case you need to touch up your lipstick or something. You could just leave it at your table or have your maid of honor hold onto it. 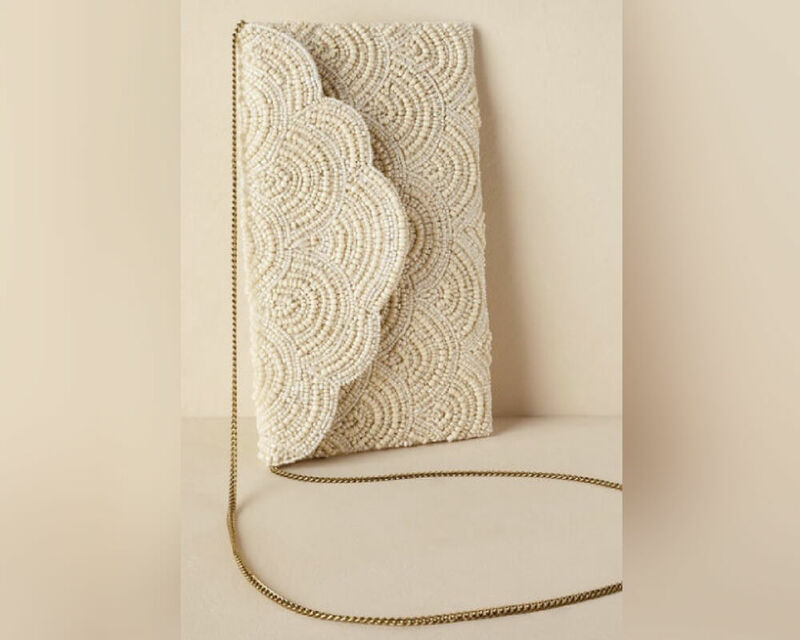 This purse retails for $145, and you can wear it with or without the strap. The bride who purchased this clip has blue hair with purple and yellow highlights. This clip will be the final fantasy element that takes her look over the top. For those of you who aren’t already fully immersed in all things bridal, BHLDN is Anthropologie’s bridal offshoot. They carry bohemian, vintage-inspired, reasonably priced dresses and accessories. 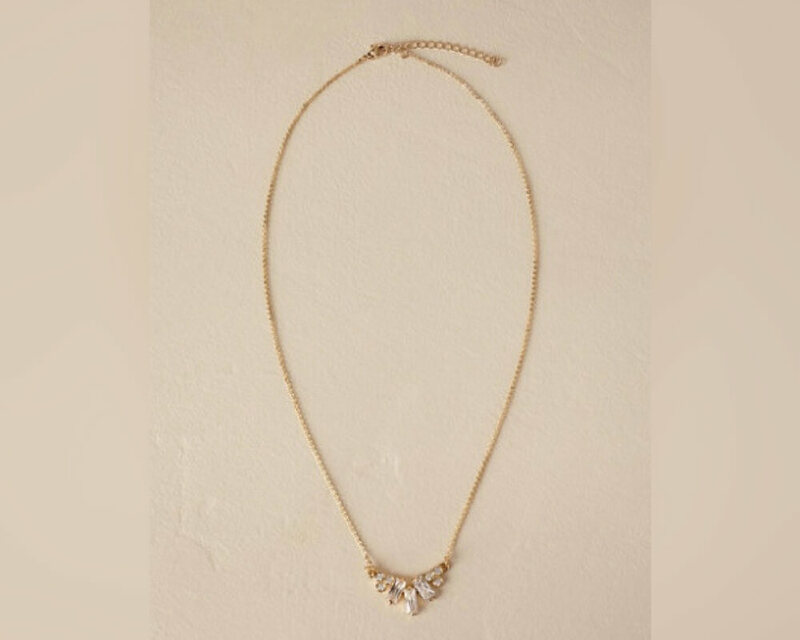 This simple yet substantial necklace would look so good with so many of their dress styles. 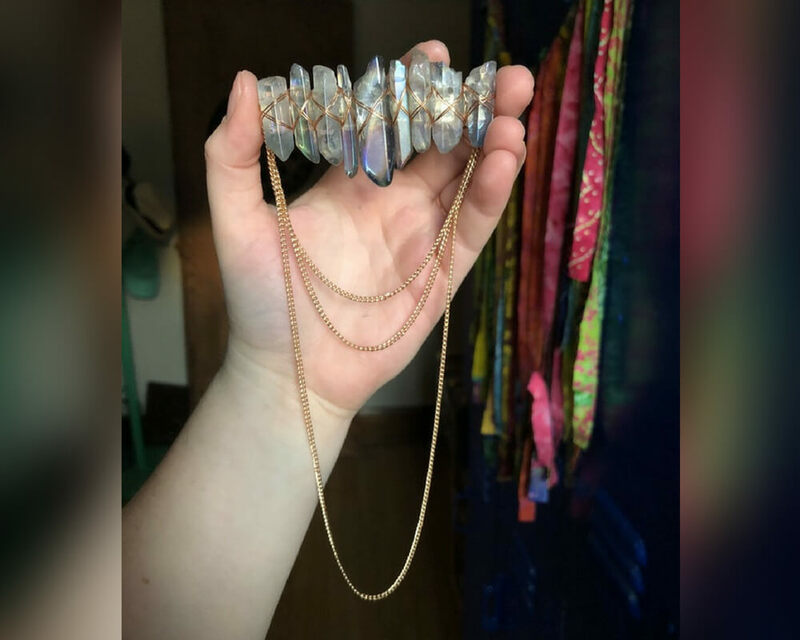 It’s an art deco cluster of crystals on a gold chain, and I would wear this on my wedding day and every day. These shoes are actually a work of art. I can’t stop staring at them. 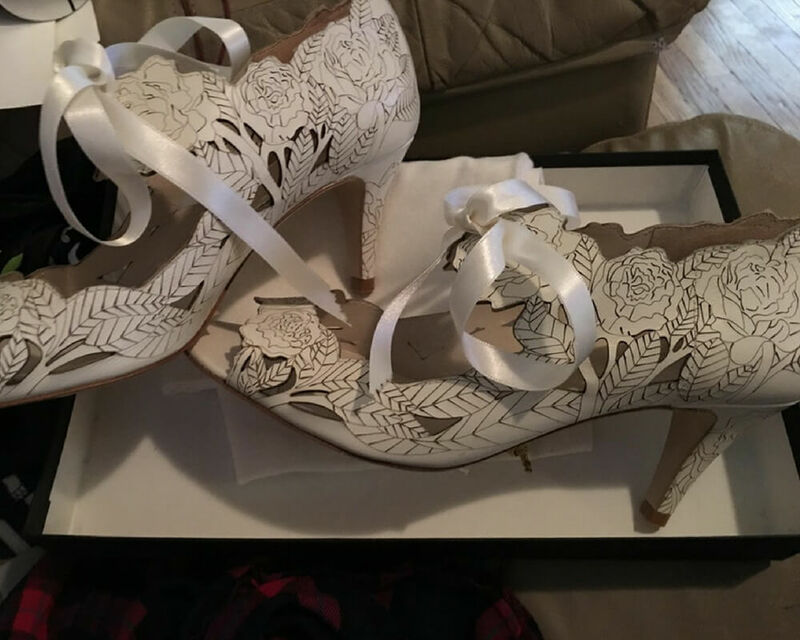 These shoes were being sold on BHLDN’s website for $200, however, they are now completely sold out. 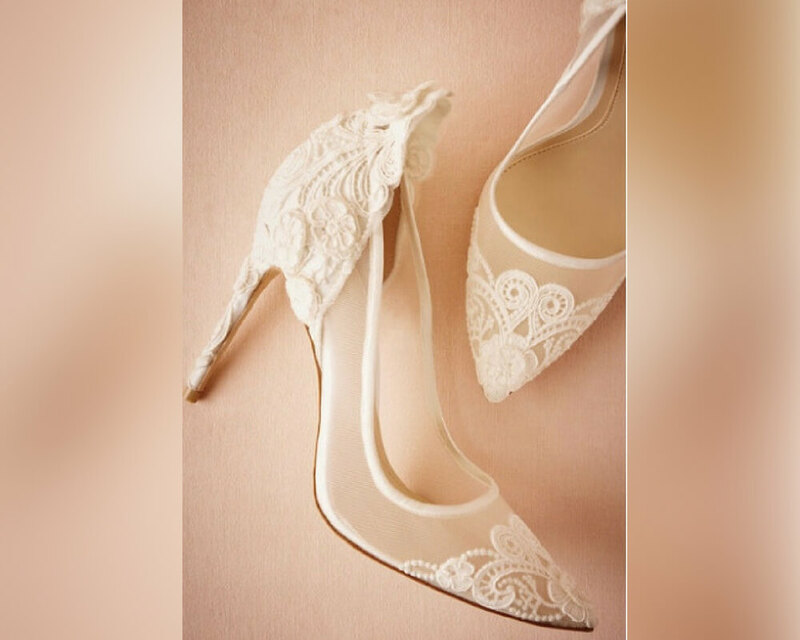 Lots of brides like to resell their wedding accessories after the big day is over though, so if you find someone selling these shoes in your size, you could be in luck! They’re also less expensive when you get them second hand. This just might be one of the most versatile bridal accessories out there. You can run this gold-plated sparkler through your braid, or around your updo, or wear it as a halo. The possibilities are endless. 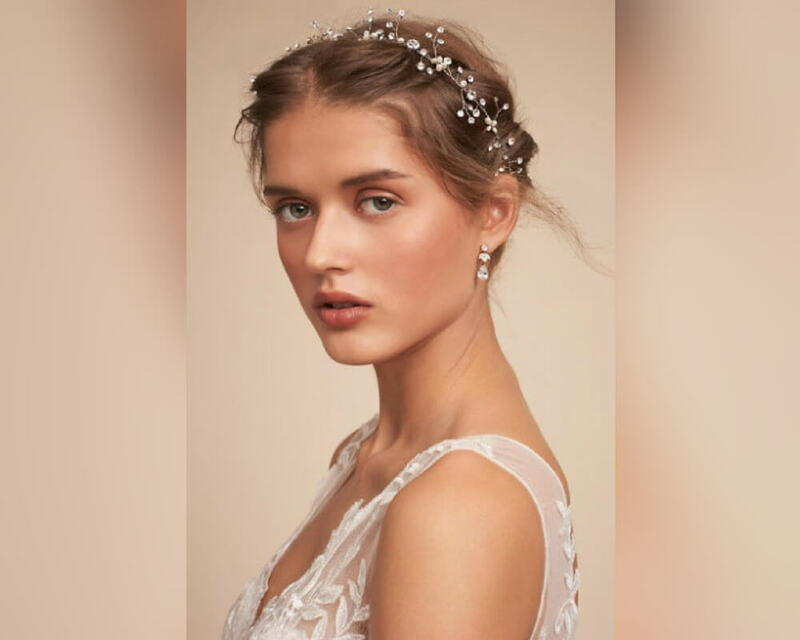 This sparkly accessory retails for $190 from BHLDN. I’m sure that you can find similar, less expensive pieces on Etsy or on Amazon. I love the idea of braiding a strand of pearls into your hair. It looks so romantic! Michael’s is a great place to find wedding decor and to get supplies for wedding DIYs. 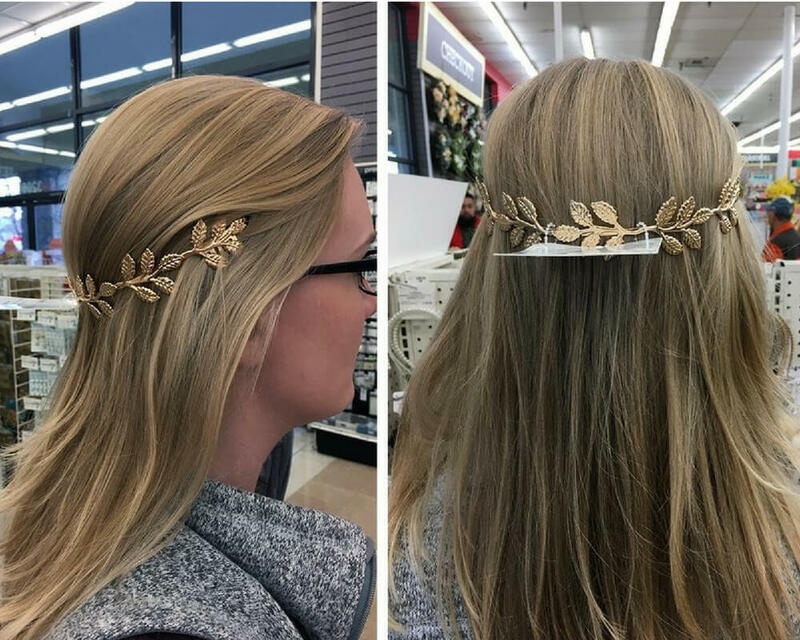 This bride-to-be found a gorgeous headpiece at Michael’s for only $5.99. It’s probably not made of quality materials like the more expensive headpieces on this list, but for $5.99, can you really go wrong? Even if you don’t think it’s fancy enough to wear on your actual wedding day, you could always wear it to your rehearsal dinner or to an engagement party. 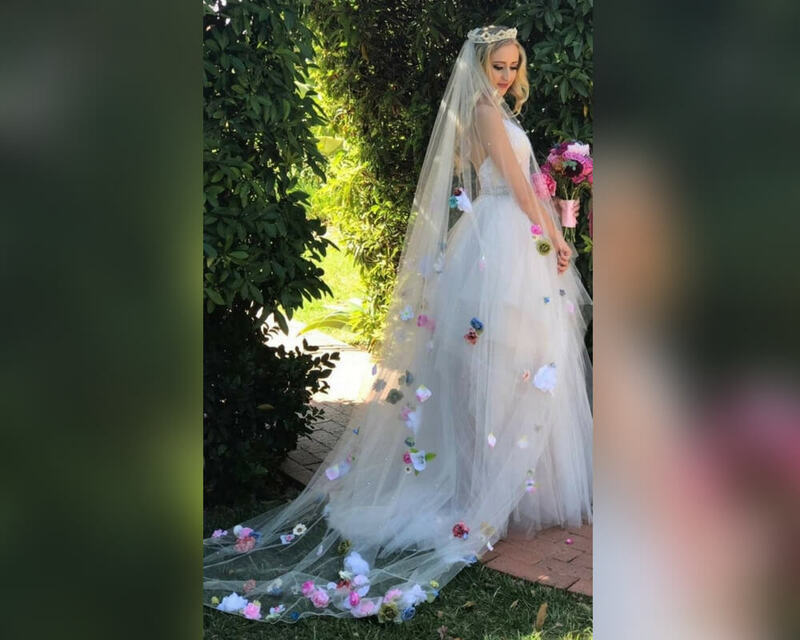 If you are having any sort of garden themed wedding, this veil would be absolutely amazing. A veil like this is a great way to add color to your outfit without adding color directly onto your dress. You have to be a little bit bold to go for a veil like this, but it’s good to be a little bit bold sometimes. This is whimsical as heck and I am very into it. 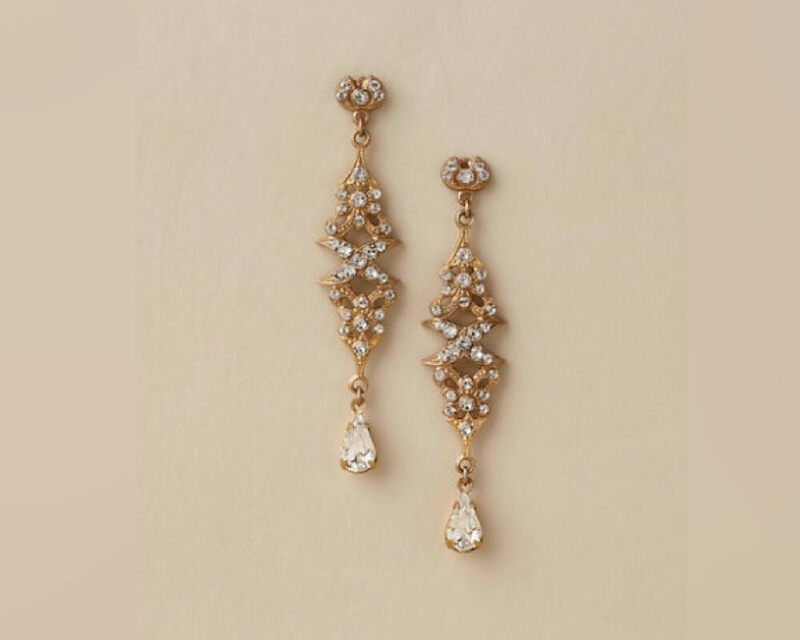 There are so many gorgeous earrings on BHLDN’s website, but I was particularly drawn to these ones. Maybe it’s because I’m a yellow gold kind of gal, or maybe it’s because these look like they’d be such a perfect length (not too long and not too short). These retail for $275. They’re nickel-free and made with Swarovski crystals. They definitely make a statement, but they’re not so bold that they’ll steal the thunder from your face or your dress. These shoes are what I think of when I picture wedding shoes. They’re light, ethereal, lacy, and white. These would go with almost any wedding dress. Careful with that little heel if you’re getting married outside, though. I could just see myself walking down the aisle and fully sinking into the grass with every step. Keep reading to see a shoe option that’s similar to these Victoria pumps, but with a little bit more edge. 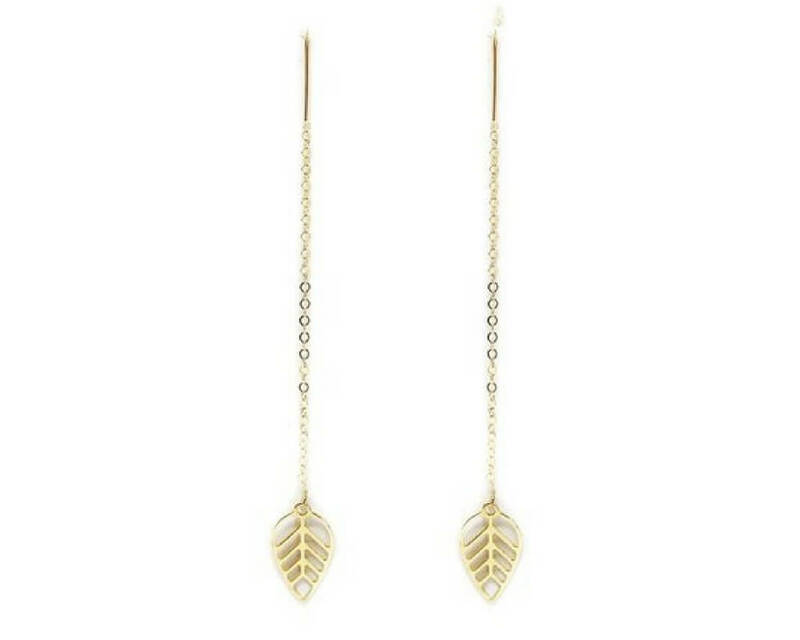 You can find these gorgeous 14 karat gold leaf drop earrings on Etsy for $134. Drop earrings are perfect for brides who want to wear their hair down (although I think these earrings would also look great with an updo). These are so dainty and exquisitely detailed. Also, I would totally wear these after the wedding. Who am I kidding, I would wear them every day. 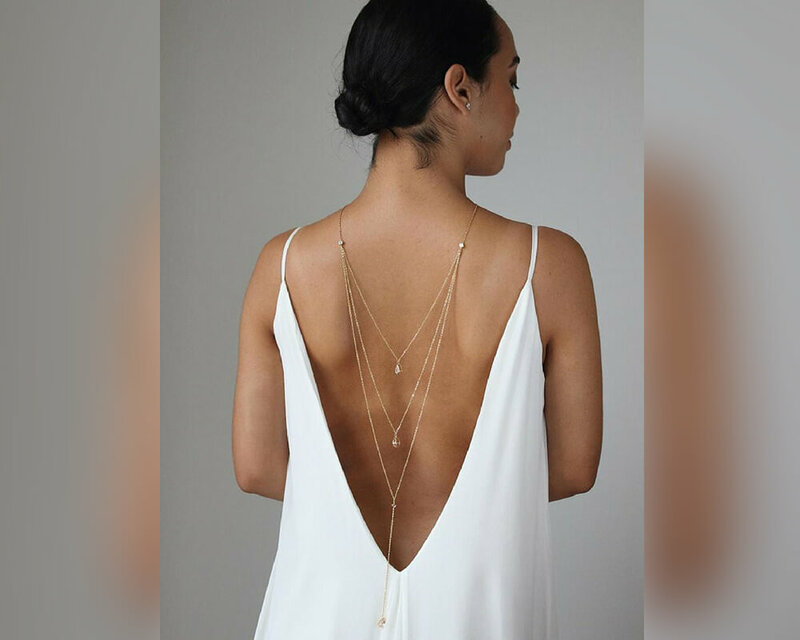 This back pendant necklace from DavieandChiyo on Etsy is perfect for any dress with a low back. Low back dresses are super trendy right now. This piece retails for $146. It’s gold with hanging crystals. This product has tons of great reviews on Etsy. Brides have been very happy with this purchase, and I can definitely see why. I might consider getting a dress with a low back just so I can wear jewelry like this. Honestly, these shoes are completely blowing me away. I love midi boots. I think they’re super flattering, and they have sort of a desert chick vintage vibe that’s right up my alley. 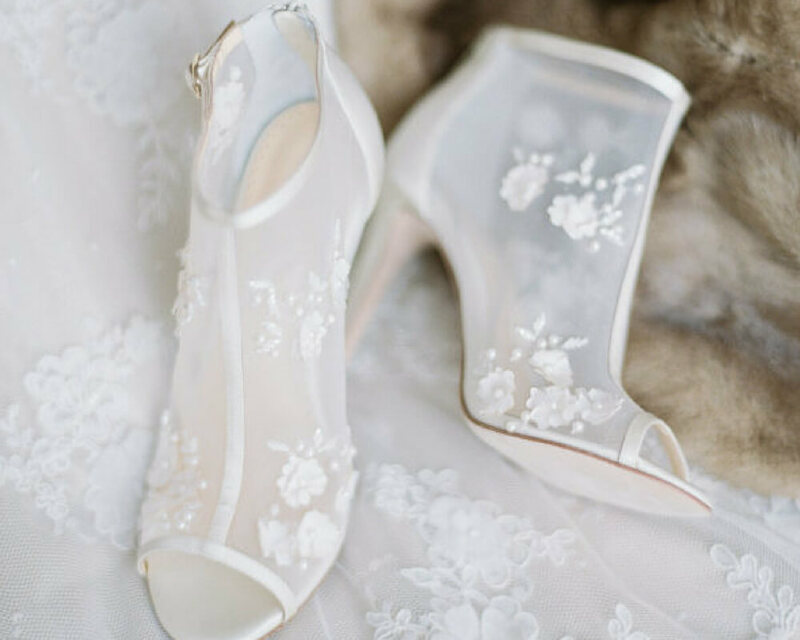 These would look so great with any kind of lace wedding dress. I think I may even like them better than the Victoria Pumps, which is saying something. There are so many good shoe options, how are we supposed to choose? I love the idea of wearing actual flowers and foliage in your hair on your wedding day. Sometimes it’s easier to wear fake flowers though. 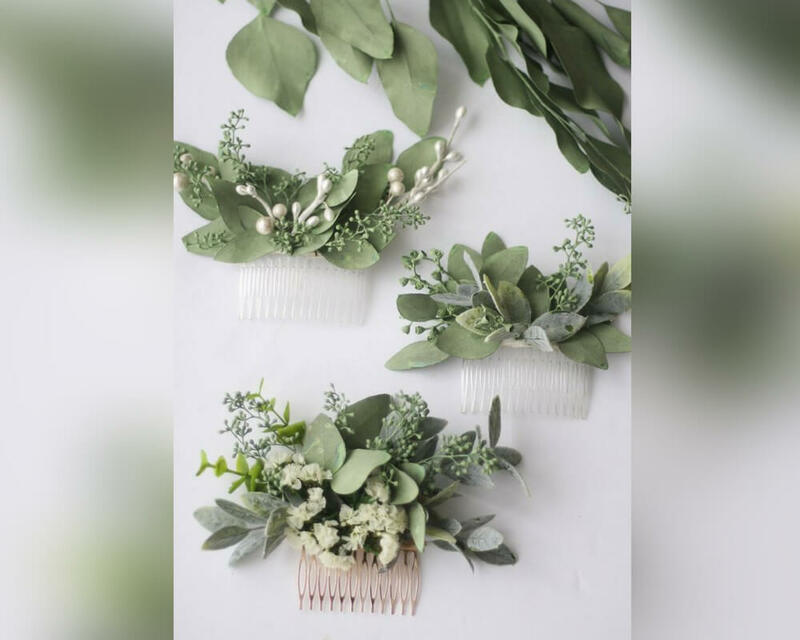 Fake flowers don’t need to be stored as carefully as real flowers, and they last way longer. These retail for $50 on Etsy. They would look super pretty with an updo or with a half-up-half-down look. It may not smell as good as actual flowers, but it looks almost identical to the real thing. Even though your guests (hopefully) won’t be able to see your undergarments on your big day, what you wear under your dress can make a big difference to your overall look. If your dress has a low back, and you’re not the type of girl who can go braless, try these bra extenders. They lower the band of your bra with criss-cross technology so any lingerie stays tucked away and out of sight. This giant Midnight Rose Comb from BHLDN would look amazing with an updo and a Spanish-inspired dress. Porcelain-painted silk gives the comb a modern matte texture, and the design of the comb is inspired by wild English roses after the summer rain. 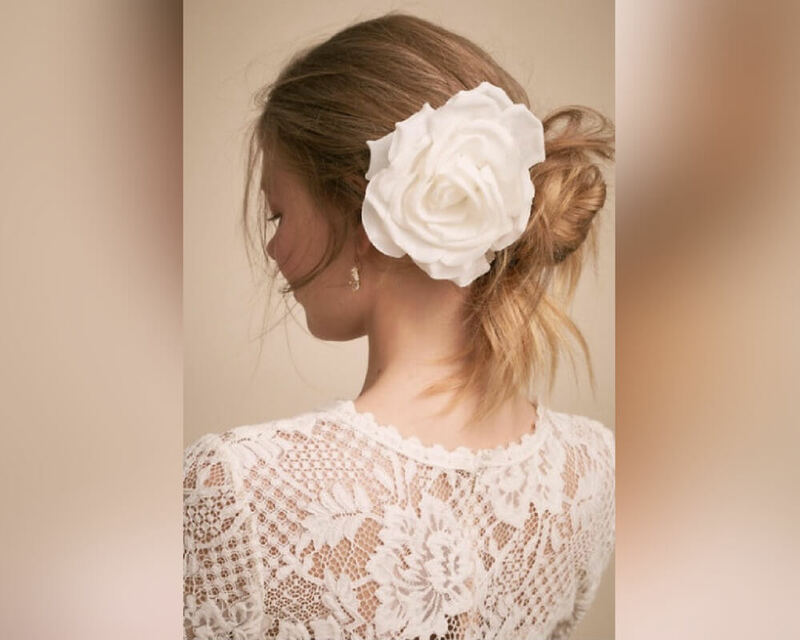 This hair accessory retails for $275, BHLDN also carries a set of three smaller flower hair pins that retail for $125. BHLDN carries a whole bunch of different veils in all different lengths. This one is my personal favorite. It’s a chapel length veil with delicate lace appliques along the edge of it. This veil retails for $437, which is sort of middle of the road as far as veil pricing goes. You can find a less expensive dupe on Etsy or on Amazon. I will never understand how a piece of tulle could cost so much money. Wedding prices, I guess. Like all of BHLDN’s bridal accessories, this Josefina Halo was handmade in the USA. This piece is wired by hand to form a delicate vine studded with freshwater pearls and glass crystals. You can also wear this halo as a belt (or as a halo to your ceremony and as a belt to your reception to get two looks in one). This piece retails for $200.